Last month, in Ottawa, we delivered our third training week focused on ‘Trial & Error’. We share what we did as part of this phase, and the challenges - both practical and emotional - that embracing a process of iteration and possible failure can bring to both the learners and the facilitation team. It’s been five months since we started our journey working with 18 Government of Canada Entrepreneurs (GCEs) on the States of Change learning programme, in partnership with the Impact & Innovation Unit at the Privy Council. Over this time, our international team and faculty have been working with the cohort to develop their experimental approach to problem-solving using the experimental continuum. The aim of the week in Ottawa was to support the participants as they reflected on their approach to four flagship projects focusing on artificial intelligence for translation, blockchain for digital identity, challenge prizes for food security and data for mental health. It involved sessions delivered by our core team (Marco, Jesper and myself) as well as guest stars Kelly Duggan, faculty member Bryan Boyer and Privy Council colleague Steve Morris. Our last week with our GCEs was a humbling reminder of just how emotional this can be in practice, particularly when those challenging your work are also the ones supporting you. Firstly, why trial and error? There are plenty of examples of policies that have been developed on assumptions and then implemented (and failed) with a “big bang”. One of the ways that we challenge this is by encouraging our learners to see their ideas as testable hypotheses. In between exploring options and validating a hypothesis, there is a phase focused on ‘trial-and-error’. The objective of this is to increase your knowledge about what you know to be true about the potential real-life effects of your hypothesis and learning about the fit and function of the potential solution. There was already an energy and need to concretely test, iterate and reframe the cohort’s work. To begin this process the participants spent two days making the case for their project. This started with a presentation from each of the project teams on their progress so far (aka a project review). After this, Bryan began with a session on how to develop a different pitch for a range of audiences. Practicing how to better make the case for their work. We supported them to share the potential of their problem area and approach using storytelling and visual communication. They had to be bold and look 20 years in the future, imagining their idea as a front page story. This way, we hoped to broaden the vision and impact of their projects. The second day built on the first by looking at how to strategically position the projects in order to support their cross-departmental nature. In this session amongst other things, the groups developed ‘me, we, everybody’ statements to consider why their stakeholder would buy into their project. We moved on to developing their way of working - both as teams and as a broader cohort. 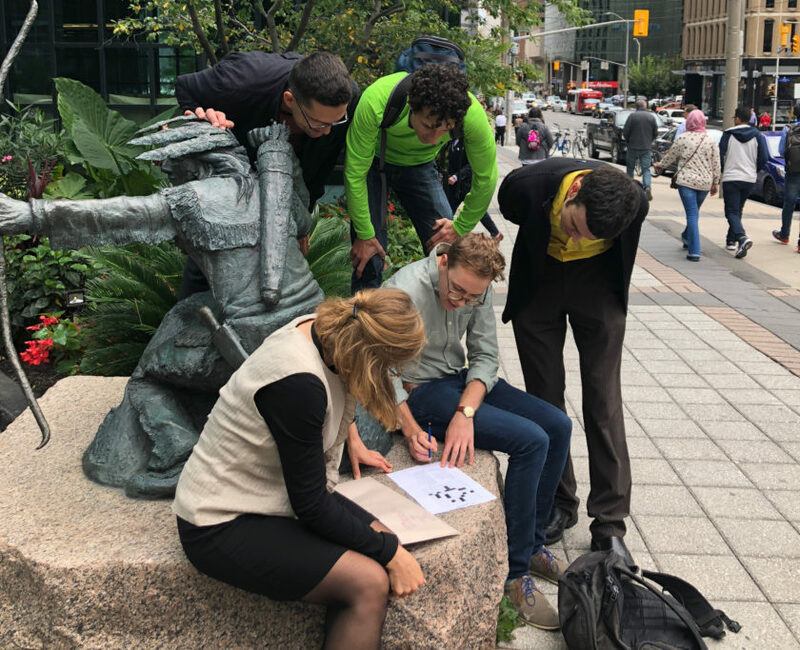 This started with a team puzzle designed by GC Entrepreneur and quiz Champion Dave, which took the group around Ottawa finding out more about each other, the States of Change team and the Privy Council’s Office. This was followed by a ‘mini-retreat’ that took place in one of the many green open spaces in Ottawa, and focused on two main challenges we have observed the cohort facing. Firstly, to encourage the groups to have a more open conversation around their collective strengths and challenges, and secondly, to build trust and understanding within the project teams. The first of these was explored through a competitive team game, a variation of the prisoner’s dilemma. It exposed the tensions within their role as both entrepreneurs while also belonging to a variety of different departments. It provided the space for them to develop approaches for managing these tensions in the future. For the second, the group completed a user manual to better understand how as teams they can work most effectively. The fourth day explored generating and using evidence to test your hypothesis. It kicked off with a session where teams had to consider the evidence currently supporting their hypothesis, how it supports their theory of change and what future evidence (both quantitative and qualitative) needs to be generated through their project. Building on this, Privy Council expert Steve Morrison led a session on the visual communication of evidence, providing practical tips on how to build a data visualisation that can generate useful information. The day finished with an introduction to prototyping by Marco that introduced this as an approach not only for products but also for interactions. By making their ideas more concrete and testable it supported the group to better consider how to approach the collaborations and relationships that are so essential for a policy entrepreneur. This session included a practical simulation in which the groups were asked to prototype and iterate a stakeholder meeting based on a scenario from the education sector in Finland. Similarly to the first day, the final started with a project review in which the teams delivered their iterated project pitch to the team and received feedback on their progress based on the themes of the week. The week wrapped up with a session on the learning goals of the cohort, which had been gathered through earlier one-to-one mentoring calls with them. By discussing these together, we highlighted the shared areas that they would like to work on and surface suggestions collectively for how these could be tackled. The aim of the week was to move the cohort beyond the comfort of defining the problem, and push them to get out there to test and validate their ideas. It was ambitious in its attempt to support and challenge the groups at multiple levels (individual, project, team, cohort), and whilst it was successful in its aim for many of the group, for a few the experience was an emotional one, with one feeling ‘this week was tough and sometimes demoralising’. 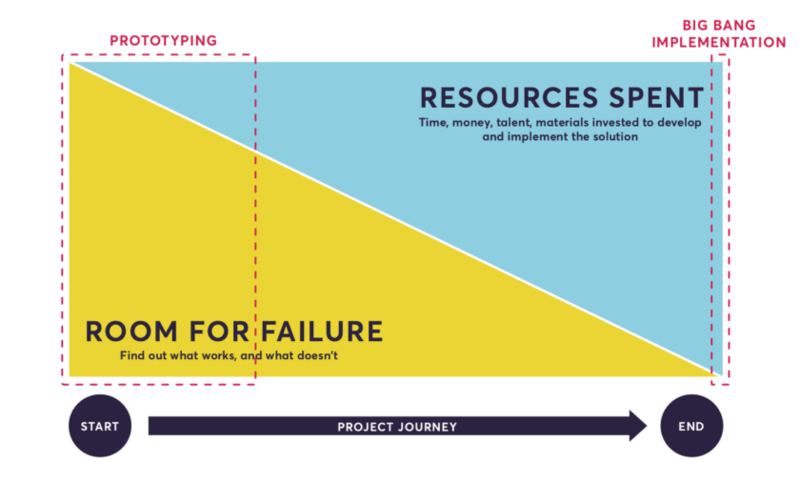 The vulnerability and fear of failure that an experimental process can bring is something that we’ve mentioned in our blogs before, it's an important feeling on a journey of transformation. As Brene Brown explains, “to create is to make something that has never existed before. There’s nothing more vulnerable than that.” It’s therefore natural that this vulnerability or fear of failure can lead to us reverting to our business as usual approaches. States of Change requires high levels of resilience from our project teams. Our last week with our GCEs was a humbling reminder of just how emotional this can be in practice, particularly when those challenging your work are also the ones supporting you. The trial & error week also proved to be difficult for the facilitation team! 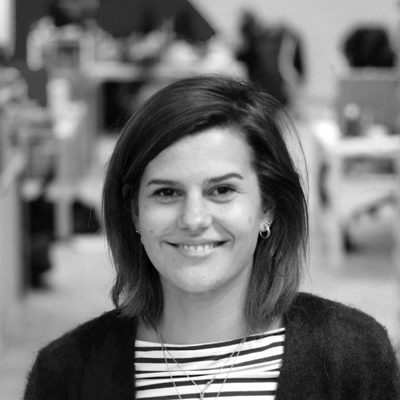 Its focus on challenging, testing and pushing ideas required us to step into the role of a friendly critic. This naturally caused some (negative) reaction from the project teams. In any development programme, it is difficult to balance the need to challenge and support learners. What is the right level of provocation to stretch ideas, without pushing someone into a place of anxiety and frustration? It’s a fine line to tread, especially when every learner’s limits are different. The coming weeks and months, in which we will continue to work with the project teams remotely, will provide us with some indication of how much this has helped. In the meantime, we remain inspired by the energy and enthusiasm that the cohort brings to their work and are glad to be with them on this journey.